friends are reporting plenty of shallower bigger bass on Geneva. smallie, then went to Crandals and sent several chickens to “chicken heaven”. and he caught more that his dad and I. He let us know about it several times during the day. The following day we returned to the same weed bed at the exact time of the day and was rewarded with a 41-incher. A return visit on day three netted a 51-incher. All three fish were caught between 11:50 am to 12:10 pm, all hit a black Magnum Tinseltail with shiny copper blades, and all were holding on deeper growing “fringe weeds” outside the main visible weed growth. I’m not sure why the muskies weren’t related to the clumps, slots and pockets within the bed like they usually were; this probably had something to do with the lower water levels and warmer than normal water temperatures. But the lower-growing fringe weeds held the muskies just like they have for me many times in the past. The thought amongst many readers would be to go back to that weed bed under prime conditions. We returned a couple hours before dark on the second day. There was no wind, the skies were semi-dark, and we could see the tell tail tips of the cabbage that easily enabled us to weave our Top Raiders and bucktails through weed openings and over the fringe. Nothing, not even a swirl! Yet, the following day at noon the 51-incher hit in the same area. Go figure! There were several lessons to be learned with this experience; patterning muskies to a time of the day on certain structural conditions, the importance of fishing midday, especially when the morning and evening bite is slow, and not neglecting the fringe. I did return to the same weed bed around noon on day four. For the first time the wind was not blowing into the productive edge. I fished other areas that had some wind, and where we caught fish in the past, but we drew a blank. Weeds are an aquatic plant that need sunlight to grow. If enough sunlight reaches bottom during the growing season, and the bottom is soft enough to grow weeds, let’s say major weed growth in a given lake will grow to 10-feet. But as the waters warm and the intense mid-summers sun pounds the water, lower growing weeds will often sprout deeper than 10-feet, IF a slower bottom taper exists outside the deep weed edge. The combination of enough sun and soft bottom creates mature weed growth to 10-feet in our hypothetical lake. Depths more than 10-feet/and or bottom conditions a little less than perfect will often have lower growing or scattered clumps of weeds later in summer. Although “real weeds” such as cabbage, coontail, milfoil, etc. need sunlight to grow, low-growing sand grass, which often blankets slow tapering bottoms out to 25-foot depths or more, doesn’t need much light. This is because this crispy, dill-like looking “weed” that usually grows 1 to 4-feet high is actually an algae, yet it too can be a magnet for muskies when growing outside of an edge. Fringe weeds often grow just outside a major weed bed. A slower tapering bottom is a big factor in establishing this lower growing growth. If a sharp drop-off exists at the weed edge, there is usually no secondary weed growth. But often the taper flattens out a bit in spots, and when this occurs you have often found that “spot on a spot” that will consistently hold a musky along a particular structure or edge. Another important fringe situation may occure on a weedy or weed-lined hump, high spot, or island. Most musky anglers have encountered this structural condition many times. Around 90% of this structure the weedline drops pretty sharply. But often there is one or two slower tapering points coming off the structure, just enough to create a finger or two of fringe weeds. You can bet that nine times out of ten this is where a musky using this structure will show up. The same scenario can play out along a shoreline-connected weed edge. Sharp break, weeds end, slower taper=fringe weeds=musky. Even when slop fishing shallower waters, fringe weeds are often the key to success. Many times a shallower bay loaded with pads, wild rice, or other emergent vegetation can hold a monster. In areas of a lake where there isn’t much deeper water, these slop bays can often hold the musky of your dreams! These bays can also be productive during warm afternoons after cool evenings or mornings; also on cloudy days when the fish are roaming and active. If you position the boat close to the above water visible weed edge and cast into the slop, you will often hurt your chances for success. Many times there will be isolated lower growing or patchy hard to spot cabbage, coontail, or milfoil growing slightly deeper just outside the visible vegetation. And often this is where the fish position for attack, so generally you don’t want to get too close to the above water vegetation or you will spook the muskies with the boat. There are several ways to attack this problem. If you do fish fairly tight to the visible vegetation, and run to close to the fringe weeds, just reposition next time the spot is fished. This often gives you a clue to the way the weed growth is in this particular lake and on the next spot hold further away. But if I choose this tighter approach because muskies have often been found in the visible cover on this spot, every few casts I’m fire a bomb cast ahead of the boat and out into the more open water as a check. Or you can start out laying back and work your way in. Sometime if the light is right you may be able to spot dark patches of these isolated weed beds, or see the tell-tale tips of cabbage weeds as they pop through the surface. I’ve said many times that one major key that separates a top of the line musky angler from the rest, is knowing how and when to fish a specific structural element. Let’s say we have a lake where the muskies are generally weed orientated. If you fish the weeds like most everyone else, your results will be generally like everyone elses…average! On a lake where the bite is pretty much related to weeds, you have to ask yourself how you can be different. For starters, lakes of this type generally have a lot of fringe weed potential. And often, because of slow-tapering areas that often exist, you can run into a “double fringe” situation. I’ve caught numerous muskies and some real big ones over secondary fringe weeds, which are usually sand grass growing several feet or more off bottom. One incident that really comes to mine is the first time I fished the upper Manitou in Ontario. An angler that was a local legend and had fished the lake for years was showing me around this clear trophy body of water. I was following him with my good friend noted outdoor writer Bob McNally. As we zipped across a wide slow-tapering bay, I could see a couple anglers a few hundred yards away who were fishing a shoreline connected weed bed. As usual I was paying attention to my sonar as we motored along and noted a lot of short weed clumps in the 10 to 12-foot depths. I tried to signal our lead boat to stop but the driver was looking forward and kept going. I told McNally to toss out a jerkbait because I wanted to troll around this low-weed studded flat for a few minutes. Within 5 minutes our lead boat had returned to see what happened to us, just as we were releasing our biggest musky of the trip, a beauty just shy of 50-inches. In a lake that’s pretty much ringed with weeds, the hot action for most is when the wind is blowing into a weed edge. But where are these fish when the wind is not blowing into the weed edge? They can be suspended over open water, tucked up in thick patches of vegetation, or even more likely, using the fringe. The fringe just outside the major vegetation may be the key area, but the secondary fringe which may extend out 100-yards or more is often a sleeper area where pressured muskies have learned to avoid fishing pressure. If you are a die-hard caster and won’t troll, the percentage of fringe muskies you ‘ll catch will not be nearly as many as they would be if you combined casting and trolling. You’d be ok when fishing shallow bays, but when you experience extensive weed-studded flats and long high weed edges with lower-growing similar vegetation just outside, trolling gives you a big advantage. I’ve said many times that my musky fishing usually combines both casting and trolling. Often after casting to a particular structure or edge, I’ll make a trolling pass along that edge before motoring to the next spot. Not only are we presenting lures deeper and possibly with more speed, the lures may also be getting to fish that may not have seen our casting presentations. Trolling also enables me to better understand the contour of an edge, and to more easily uncover small fish-holding fingers with fringe. Another tip is to pay attention to the wake behind your motor. When a slight swing out occurs when you are following a depth level, watch for low-growing weeds on your sonar. The first time I heard the term “pattern fishing” was in the late 70’s. Both Roland Martin and Babe Winkelman commonly used the term in articles they wrote for Fishing Facts magazine when talking about how to find and catch more fish in the shortest amount of time possible. The basic concept of pattern fishing is recognizing a certain set of conditions that has produced some fish, then duplicating the conditions in other spots on the lake. A simple example is catching some bass on specific crankbait in 5 to 8-feet of water on a wind-blown chunk-rock point. The logical thing a good pattern angler would do under those conditions is to search out similar structural situations and fish them in the same manner. If success continues keep doing it until the action stops. Even if the pattern is strong, not every similar spot may hold fish. If you fish a few more similar spots and don’t catch fish, then start doing other things. Patterns may change several times during the day because of wind direction and speed, light conditions, time of day and water temperature. And while catching several bass or walleyes can put you on the road to putting together a productive pattern, a single musky follow may help you solve the puzzle to finding more fish. Most musky anglers really don’t understand pattern fishing. Too many times I’ve seen anglers go from one unrelated spot to another. They may go from a weed bed to a rock hump, to a chunk rock bank, which is followed to a visit to a wind-blown point. If you are not seeing fish that’s ok, because you are trying to put together a game plan, but if you encounter muskies on one of those types of spots, jump on the pattern and fish as many similar spots as possible. Don’t start jumping around and fishing different types of areas. Last summer we fished a small isolated bed of cabbage in an otherwise rocky area. A big musky came roaring out of the cabbage and was caught. We knew of a similar small bed a few hundred yards away. The first cast into that bed produced another big fish. Back to back casts actually produced 98 inches of muskies because we recognized a hot pattern and jumped on it. My first 30-pound musky came out of Conneaut Lake in Pennsylvania in the late 70’s. The first time I fished the lake in mid-October we trolled the weed edge with deep-diving crankbaits. The four of us in two boats caught 22 muskies over a long weekend, but all the fish were 12 to 18-pounds. I went back two weeks later and the same pattern held; 12 to 18-pound fish along the deep weed edge. After catching a few fish I started to think about why we weren’t catching any of the bigger fish that were noted to be in the lake. Maybe the pattern for bigger fish was different. Since trolling was great along the straight edges and points, maybe the bigger muskies were holding in spots where trolling wasn’t reaching them. I had an excellent contour map that even showed bottom composition. We started to jig fish inside turns in the weedline that had hard bottom (rock/shale). In short order we got a 49-incher, another nice one and a quality follow. An early lesson I learned many years ago was that bigger fish are often on a different pattern than smaller muskies. During August of 2010 Joe Bucher and I were filming and fishing on Lake of the Woods. We were having a pretty good day with 4 muskies landed by late afternoon. The conditions began to change as the skies darkened and the wind subsided. If there was ever a time that spelled top water, this was it. I quickly tied on “froggy”, my favorite pattern Top Raider, while Joe went with a black “Raider”. A nice musky was boated within a cast or two off an extended shallow rock flat. A quick meeting of the minds and we decided to run and gun from one rock flat to another. We fished seven similar types of structures before dark; saw six muskies and boated five. After going “two for two” right off the start, we were like two sharks smelling blood! While Joe was wrapping each catch on tape for his TV show, I was frantically waving in the background for him to hurry up so we can run to the next spot. I knew we had a hot pattern and wanted to cash in on it as much as possible! We never considered trying other type spots. If weather and water conditions remain pretty consistent, patterns tend to hold for longer periods of time. But changes in wind direction and speed, light penetration, current and time of day can alter a fish-catching pattern. If light penetration lessons, look for fish to move shallower or hold higher in the water column. If light penetration intensifies, muskies usually tend to drop down or hole up in cover. A big exception to this is a warm up after some coolness. After a cool evening or cold front, it’s not uncommon to find muskies sliding into some sheltered afternoon spots where solar heat warms them up. But with surface water temperature in the low 80’s, which was the case last year on some lakes I fished, these “killer” afternoon spots didn’t hold muskies. After a period of cooler weather that lowered the water temperatures, the pattern again became strong. For years I expected an afternoon bite to supply the best action of the day after a cold front. But if the nighttime lows don’t get lower than the existing water temperature, the morning bite can also be pretty good. Wind almost always plays a big part in putting together a productive pattern. Most of the time I’ll fish the wind, but if it’s a real good spot all of it gets fished. If the winds are light to medium, most fish seen will tend to use the up-wind parts of structure or edges. The stronger the wind the better the odds of some muskies moving into areas of secondary winds or backwashes. So pay attention to degrees of wind during the day, because wind direction and velocity can alter patterns. Current can also create patterns. An increase in wind velocity many turn on necked-down areas. In a large body of water, a strong south wind for a day or more may move water northward. After the wind lessons or changes direction, water flow often hits spots from a new direction, which can affect musky usage and/or positioning. In reservoirs that open the locks on the dams, current is created. I know of instances where locks were opened at a specific time each afternoon, and shortly afterwards main lake points, particularly those in necked down areas, experienced hot musky action. Current may or may not be affected by wind. A good clue to spotting increases in current is to note how far marker buoys are bending over, and watch the ripples where slack water borders current influenced runs. To catch the most weed-related muskies as possible, you have to pay attention to details. Anyone can catch a fish by tossing a bucktail over the top of a weed bed, but understanding pattern fishing is a big step in helping you consistently catch numbers of muskies. Anytime you encounter a musky, pay strong attention to the details surrounding the sighting. Picking a high percentage weed bed to fish is a good starting point. Unless light penetration is minimal, I generally motor to the weeds being hit by wind or current. I also prefer weed beds that have more “character”. By that I mean more irregularity to their edges. If you see a fish ask yourself, “did it come off a point or inside turn in the weed bed, or was there a thick clump of weeds in an otherwise sparse bed or an opening in a thick bed?” I’ve had a number of multi-fish days because I noted muskies were only holding on areas along the weed bed where the edge next to deep water wasn’t as abrupt. These smaller areas of slower tapers had deep fringe weeds that the muskies favored. Several times in fall on lakes ringed with weeds, the hot pattern was fishing just outside sparser weeds. I first discovered this pattern after a slow day of fishing weed areas that had been productive in the past. On this first trip I noted the few follows we had come outside areas with a little less weed growth. After going into the weed bed and looking around, we saw the reduced weed growth was caused by scattered gravel within the bed. Many of these small hard bottom openings had panfish hovering over them. Now things made sense. Dying weeds use up oxygen in the fall, so holding in sparse weeds were the panfishes best option, rather than dropping down into deeper water outside the weeds where they were more exposed to waiting hungry fall muskies. We had our best couple days of the year after fine-tuning this fall weed pattern, and only fishing about 10 to 15-percent of the lake that had sparser weed growth. As you develop more fish-catching patterns through the years, they’ll give you a good starting point when fishing a new body of water. On a shallower weedy lake a big part of a productive pattern is fishing weeds that the wind is blowing in. While this may be great for catching a musky or two, the larger fish will generally be holding up-wind from major weed beds. Since this type of lake has a slower-tapering bottom, fringe weeds and deeper clumps of sand grass often exist in slighter deeper water than the main weed bed. These areas along with possible deeper scattered rocks and slight hard bottom rises would generally be the holding areas for the bigger fish. Past success with this pattern would have me trolling crankbaits or deeper-running jerkbaits across this area in sort of a lazy s pattern. The wind was perfect last August; just strong enough to position muskies on the up-wind sides of rock structures, yet not so strong it would make boat control a challenge. Dan Kuesis, Dave Flores and I began working windy points, and started to think about putting together a pattern. Were the muskies holding on the ends of points? Were they tight on corners or inside turns closer to the shore? Maybe they were high on the structures or laying further back on the edges? Possibly suspended off the points? While several of these factors came into play, the real key to our success was the type of point we fished. In short order, a certain type of point seemed to be the preferred structure. Short points or narrow points, even if they extended out quite a bit, were fishless. Virtually every point that had width harbored a fish. Also very productive were double points on the up-wind edges of islands that had a rocky flat that connected the two points. The action was consistent throughout the day, as we saw about 25 muskies and landed a few, topped by a super thick 50 plus incher that grabbed a Bucher Mag. Tinsel Tail on the first turn of a figure 8. While fishing on the last evening of the Musky Hunter School on Lake of the Wood’s last July with friends Mike Persson and Tom Kersten, we hit on a hot pattern and quickly rode it to success. After fishing a variety of spots, a thought passed my mind. I knew that wind-pounded large rocks and boulders in shallow water often attracted muskies. While these three-four foot deep spots might not hold active fish during brighter calmer conditions, they often become magnets for hungry muskies when the wind pounds into them. With the day nearing its end, we control drifted along a rock-studded shallow bay. Bang! A 50-incher smashed the cisco-patterned Mag Tinsel Tail halfway to the boat. A few quick photos and we were off to another shallow wind-blasted rocky spot. A big one followed a Shallow Invader to the boat, then hit on the first turn of a figure 8. Unfortunately, the hook must have hit bone and the encounter only lasted seconds. Disappointing… but we at least had one big one and were on a hot pattern. Our third spot was another shallow boulder-studded bay pounded by wind. After a few casts a 49-incher came charging after the Mag Tinsel Tail, hit on a figure 8 and was landed after a short line battle. Three big fish on three similar spots; or remember the two big ones on back to back casts I talked about earlier. If you’re not thinking about pattern fishing for muskies, you should be! 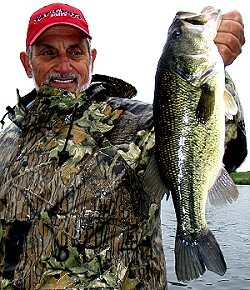 Go to author Spence Petros’ web-site (www.spencepetros.com) and sign up for his free fishing reports newsletter. Your address will not be given to anyone else. There is nothing as exciting to me in fresh water fishing as watching a big musky blow up on a top water and tail-walk across the surface, or see the white flash inside a 50-inchers mouth as she grabs a lure 18 inches from your rod tip during a figure 8. These are certainly memories that will forever be cherished, but there are plenty of other a little less exciting ways to catch muskies. But hooking a good one, whatever legal method is used, is always a big thrill. About 30% of the muskies I catch every year are caught by trolling. Would I rather catch these fish by casting? Of course! But the majority of these fish would not have been caught by casting. Some of the muskies came from the edges of rocky flats or weed beds that were pounded by strong winds that would have made boat control via an electric motor very difficult, if not impossible. Some were in depths not easily fished with a cast lure, and many came on speeds that would be tough to achieve or maintain with a retrieve. Then there were the fish holding over a slow-tapering flat with scattered cover, along almost non-descript breaklines, or suspended in a slot, bay mouth or basin that would be very difficult and time consuming spots to cast. Trolling also helps me learn a lake quicker, and to find out of the way mini-spots that would not likely be found by casting. As I said, I’d rather catch them casting, but I’d also rather catch more muskies than not. A lot of anglers view trolling as something anybody can do; just toss a lure behind the boat and go. Precision trolling structure and edges, particular over cover-strewn bottoms, is a lot more difficult that casting and retrieving a lure. A good game plan must also exist when multi-line trolling with boards various distances from the boat Being precise, using the right equipment, and doing a lot of small things correctly will go a long way towards trolling success. Here are some of basics that will make trolling more productive for you. All of the top of the line trollers I know are dialed in to the running depths of the crankbaits they use. A line counter reel is almost a necessity, but some anglers just count the back and forth passes of a side-to-side moving level wind on their bait-casting or trolling reel. Knowing EXACTLY how much line you have out is very important. It allows you to return to a productive depth level and to set other lines to that depth range. Another big key is precision lure control over a rocky bottom or sub-surface weeds. If you try to consistently bump a lure over a rocky bottom, a lot of snags will occur. I generally try to troll a crankbait a foot or two above a rocky bottom and just tap the high spots. By just making contact with the high spots you will avoid most snags, know you’re lure is running at the right level, plus this occasionally bumping will trigger strikes from following muskies. Learn the running depths of several lures with given amounts of line out. When trolling an edge that breaks at 10-feet, I may troll a 9-inch Shallow Raider with 40-feet of line out on the inside line because it will get down to around 9-feet. The outside line that borders deeper water might be more suited for a deeper running lure such as a Grandma or Depth Raider. If trolling over the tops of a low weed bed, a Shallow Invader or 7-inch Shallow Raider that only goes 6-7-feet down might be my choice. When starting out and not knowing anything about a lure’s running depth, try trolling over flatter areas and note how much line is let out before a lure starts scraping bottom. Writing the information down is a great help in getting started. Knowing a certain lure contacts bottom with a specific amount of line out is also a great way to know if a lure is running correctly. If a similar lure is not tapping bottom, it’s probably not tuned as well as it could be, or has debris on it. Running a lure in the prop wash really tests its ability to run straight. Lures that track perfectly when trolled to the side of the boat, may not run true right behind the boat due to the swirling waters caused by the motor. When you get one of these great runners, put an X on it and don’t use it for anything else! All my trolling reels are spooled with braided line. I generally put on a core of 14 to 20-pound test monofilament and then about a hundred yards of 80-pound test Spider Wire Stealth. All my friends generally use braid when trolling with moderate to longer lines, but a few prefer heavy monofilament when trolling tight in the prop wash because it stretches a little under stress. I prefer braid, even on short lines, and just back off on the drag a bit. A major key to hooking and landing muskies is the type of rod used. On my annual fall trolling trip to Lake of the Woods, I always seem to lose at least a couple of big fish. And I’ve used almost every type of rod imaginable from expensive tuna rods with soft tips , various “trolling rods”, fast tip bucktail type actions, plus some odd ball stuff. My partner, Mike Zielonka, almost never loses a fish, and he uses a cheap rod and line counter reel combo that cost about $50. Last year I bought the cheapest 8-foot 2-piece glass rod I could find that was more suited for fishing with boards or downriggers. After missing three fish on the first day of our fall trip out of five that hit, I switched to my new, cheap, flexible, all glass rod that was rated for 10 to 20-pound test. During the rest of our extended week I had 19 more musky strikes and landed 18 of them. Stiffer, graphite rods just don’t hook and hold muskies when trolling with braided line as well as all glass rods that have a parabolic taper (rod bends the same throughout the blank). These softer rods allow the musky to take the lure and turn before pressure is felt, which generally results in more fish being hooked in the side of the mouth. This is much more desirable than bouncing a lure off the tough upper jaw, which is more likely to happen with a stiff rod. In addition, head shakes that could easily tear the lure free if using a stiffer rod are easily absorbed when using a more flexible rod with “forgiveness”. I use 3-foot seven strand 60-pound test wire leaders when trolling that I make myself. These longer leaders prevent cut offs from rocks a lot better than a shorter leader. Cut offs may occur if you run up too high on a rocky structure, or if a hooked fish dives into the rocks or rolls up on the line as you fight it. I use to crimp the wire leader with metal sleeves, but I found a faster more dependable way. I put the wire through a snap or swivel, turn it around about 4 times like you were doing a clinch knot, then put it back through the loop towards the direction of the snap or swivel. Pull the tag end tight slowly with a pliers until it’s firmed up, leaving about a 1/8-inch tag end. I’ve not tried this with wire stronger than 60-pound test, but 60 works great for me. A lot of anglers pay more attention to where the boat is rather than where the lure is running. Remember that when a boat turns the lure doesn’t follow the same path, but rather short cuts the boat’s path. One of the biggest trolling mistakes I see is sloppy passes on points. The bigger the point, the more potential for errors. When you come off the point and you see it drop off on the sonar, keep going straight for at least 5 to 10 seconds to make sure the lure runs off the tip. The longer the line, the longer you should go in a straight line. What I usually do is run off the point even longer than it takes the lures to reach the tip, then make a big loop over open water and come back down the opposite side of the point headed towards the shore. This big loop guarantees the lure comes off the tip, gives a following fish more time to react, and checks the open water off the point for suspended muskies. Whenever you make a turn, the lure(s) on the inside of the turn slow down, while the lure(s) on the outside speed up. Many hits on a turn occur on the inside line, the one that’s going a little slower. If I’m holding an inside turn rod, I will rip the lure forward several times until the boat straightens out and resumes a straight path. This ripping action makes up for the loss of speed on that lure and triggers strikes. Coming out of a turn with a little burst of speed is another good trigger, especially if some of the lure’s speed has been significantly reduced by the turn’s speed. Although many trollers put rods in holders, I usually don’t for several reasons. Most of my musky trolling is in Minnesota or Ontario where you are only allowed one rod. I also like to feel the strike, and I can usually catch more muskies with a hand-held rod than if a rod was in a holder. Last year on our fall trip I caught two muskies I probably would not have caught if the rod was in a holder. Both “hits” felt like someone lightly tapped my lure with a pencil. But since I knew the lure was running just over the bottom, I ripped the rod forward, dropped it back, and was greeted with a smashing strike! I’ve caught many muskies ripping the rod forward as I’ve motored over a point, sunken hump, or other spot that looked a little special as a musky lair. Controlling a boat with a tiller handle, or if someone else is operating a steering wheel makes holding a rod a lot easier. When trolling rocky areas you’re going to get hung up once in a while, no matter how careful you are. When I get hung while holding the rod, I quickly sweep the rod forward towards the bow of the boat, then reverse the direction of the pull and throw some slack into the line. The object is to quickly create slack so the crankbait floats up out of the hang. Often the snag is just the bill getting wedged in something, and if you are using a buoyant crankbait it will generally come free. If this tactic doesn’t work, turn the boat around and head directly back at the lure. Don’t jerk or put any tension on the line as you go towards the lure! And don’t make a wide swing on the way back that could wrap the line around the hang. Keep the slack out of the line and once you get on the opposite side of the hang start shaking the rod tip. These tactics work 95% of the time. The final option is to use a lure retriever. I’m not so concerned about losing a lure, but rather a fine-tuned lure that I thought was my best choice at the time! Trolling is often the best tactic to both learn and effectively fish a large weedy area. When trolling large weed flats there are several lure options I consider, which are generally based on weather conditions, weed growth, perceived activity level of the fish and with some “gut feeling” tossed into the mix. During times of lower light penetration such as morning, evening, during over-cast or windy days, or at night, I expect the fish to be more active and cruising and will start with a presentation over the higher weeds. If the weeds are 1 to 3-feet under the surface I generally start trolling with a blade bait such as a spinnerbait or bucktail. Prior to last year, spinnerbaits with two up-right single hooks would be used most of the time if fishing a weed bed that had erratic, uneven growth This style came through the weeds better than a bucktail having treble hooks. Last summer I started trolling “double 10’s” instead of spinnerbaits and the muskies crushed my Bucher’s Magnum Tinsel Tails! It seems that these big bladed lures “call” the fish better from farther distances and from cover than conventional L-armed spinnerbaits, the big churning blades push most of the higher weeds aside, plus this may be a trolling presentation in most waters that the fish haven’t seen. When fishing two lines have one running just under the surface just about where the bubbles from your motor start to dissipate, and the other one about twice that distance back. When the weeds are 4 to 7-feet under the surface, I generally short line a shallower running crankbait such as a Shallow Invader or Shallow Raider, and try to keep it just over the weed tops. Another productive option, especially if the fish aren’t too active due to weather or water conditions, or if you feel a little slower presentation is needed to pull them out of the weeds is to troll a weighted Suick or Bobbie Bait. The most frequently asked question about trolling these jerkbaits is “how fast do I troll them?” Troll them at the same speed that duplicates the action you try to get when they are cast; jerk, slight rise, jerk, slight rise, etc. Do it at the side of the boat and when you get the right rhythm, toss the lure out and maintain the same boat speed. The deep edge of the weeds is an important breakline to troll. Actually, most of my deeper trolling is along breaklines such as weed edges, and drop-offs, but I don’t overlook water color or current edges, or even the edges of suspended schools of baitfish. A lot of muskies have been caught trolling over “nothing”, but I always try to find something that may tend to be more attractive to the fish. This may be something as subtle as a slightly faster taper in an otherwise flatter area, a lip of just a foot or two in a shallower lake, or even a change in bottom consistency. The shallower the area, the more subtle the fish-holding edge will probably be! Crankbaits rule when fishing most of these edges. I prefer slimmer and/or thinner crankbaits because I think they hook a higher percentage of muskies than fat-bodied cranks. I’m know I’m leaving out many good crankbaits, but I use what has produced best for me for many years. In the 4 to 7-foot range Shallow Invaders, along with 7-inch Shallow Raiders and 7 ½ in Grandma’s are my favorites. For the 7 to 14-foot range I like 9-inch Shallow Raiders, Grandmas, and Jakes. I will also short line Depth Raiders in this range. For most of my deeper fishing, I will long line Depth Raiders, and use 13-inch Grandmas. I also try different crankbaits, but these have been my “go to” lures for quite a few years. the structure fishing revolution, I avidly taught and practiced the principles of structure fishing. Mostly I fished the deep edges of structure and cover for muskies, but had no qualms about going to adjacent shallower cover or out over open water for suspended muskies. Early in the year I wouldn’t hesitate in just a few feet of water to stir up a musky. Every now and then something would be written about muskies holding in thick, shallow weeds, but the articles generally didn’t impress me, especially when the author was holding up a hungry-looking, medium-size fish. “Big deal” I thought these weren’t the muskies I was after. The truly big fish were near deeper water – I wasn’t going to find a 30 to 40 – pound or larger fish in some thick, shallow cover where they couldn’t maneuver around to feed. I knew that in some lakes the reeds or rushes harbor some big fish but this emergent vegetation is generally near deeper water, and the fish only move up into this cover under certain weather and water conditions. Okay…so I was wrong, and I’ll be the first to admit it! There is a population of slop muskies that exist in may waters, and these fish can get huge. Now don’t get me wrong. I still fish the edges of the deepest water in an area most of the time, but I also check for slop and fish it. A short run put us into one of his favorite bays and he explained a few of the features that made the bay productive. That’s all it took, as I was off to the races with another musky-catching tactic to add to my bag of tricks. . Since that time I’ve done a fair amount of slop fishing, and under more conditions than first were encountered. I don’t pretend to be an expert on these shallow low-water tactics because there are probably numerous conditions that I’ve yet to experience. But I do know that many muskies exist in this shallow cover during warmer weather, much of the slop is overlooked, and few anglers who fish it really work it correctly. Muskies don’t need deep water to survive and thrive. In recent years I’ve been seeking out large, shallower areas in bigger waters to fish. This is because the water in these areas is more stained, muskies tend to feed better during the daylight hours, and there is less chance you have to deal with suspended fish. If a lake has large sections of 50 foot-plus depths, and good size areas with 20- to 40 food maximum depths, I may fish a few key spots in the clearer, deeper sections early and late in the day, but then I’m off to the stained, shallower water for the rest of the day. Slop fishing just takes this strategy one step farther. Instead of working a lot of 8- to 15- foot depths, now we also get into the 3- to 6-foot range. Many chains of lakes have a connecting lake that is shallower and weedier than the rest, and most anglers bypass it for the most “classic” water in the other lakes. It’s a mistake to not check out the shallower lake. 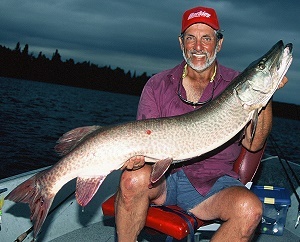 A larger lake with varied sections of water, such as Ontario’s Eagle Lake, Lake of the Woods, or rainy Lake, have extensive stained water areas where big muskies are holed up in the slop. Or a pattern might be as simple as a single slop-filled back end of the bay on a favorite small lake in Minnesota or Wisconsin. The point is, there is an under fished population of muskies using shallow, weed-choked waters that rarely, if ever, see a properly fished lure. Let’s assume we have a large, shallower section of a lake with a maximum depth of 10 to 15 feet. An excellent example of this fishery would be Osbourne and Niven Bays of Ontario’s Eagle Lake. The water in these sections will be stained and may even be downright dirty due to wind, sediment from incoming water, or tannic acid from flooded wood. Due to limited light penetration there is no deeper weed growth, with the maximum depts. Of weeds generally in the 5- to 7-foot range. Some shallow rock structures may exist, and there may be an occasional band of offshore weed growth, but the best and most cover usually exists in the back ends of the bays. Soft, silty bottom usually blankets the area outside the weeds, and much of the forage base is weed-oriented. Open water forage such as ciscoes, whitefish, herring, etc. don’t exist, which makes the muskies even more apt to use available cover. The best slop-filled back ends of bays usually have a variety of vegetation such as reeds, rushes, wild rice, cabbage, coontail and a variety of pads. The shaded water underneath this cover is probably cooler than the sun-pounded open water, the shallower areas frequently have a firmer bottom, and plenty of food roams around the shallow cover to keep a musky well fed. If a smaller water has only one slop bay, then a large patch of surface blanketing cabbage or coontail can be okay. With cover situations being equal, the bays with the deeper vegetation will usually be better than the ones with shallower growth, especially for larger fish. And a little deeper can easily be a 6-foot weed edge versus one of 5 feet. Slop fishing shouldn’t always mean fishing the thick, weedy back ends of bays. Sometimes when you’re fishing a mature weedbed in summer, the mid range to shallower sections of the bed might have thick, matted weeds on the surface. While most anglers would cast to the edge of the surface-covering weeds and bring the lures over the sub=surface vegetation, few would run lures over the thick stuff to reach isolated pockets and slots surrounded by weeds. And two reasons for that – they don’t believe a musky would hold there, and they may not know of the limited selection of lures available to work this cover effectively with minimal hang-ups. Few lures will come through emergent vegetation and slide over heavy, matted goop without fouling. They’ve also got to be heavy enough to cast far and thick line, have decent hooking power and be able to withstand the thrashing and rolling of a big musky in shallow, cover=laden water. Two proven winners are the Mister Twister Super Top Prop (model with 7/0 hook and plastic trailer), and Odyssey Lure’s Sloppee Pig spoon. The Top Prop revolves, floats at rest, and features a strong 7/0 hook with a keeper barb that goes into a 7-inch long soft plastic, split-tail trailer. Just toss this anywhere and reel in at various steady speeds. I keep the rod tip fairly low and pointed somewhat at the lure during the retrieve. The Sloppee Pig is a 2.4 ounce, wide, hard plastic spoon with a silicone skirt. I stop or slow it down just before it hits the water so it will land with the hook pointed upward. The rod is held parallel to the surface at about waist level, and I retrieve the lure in spurts – a fast turn of the reel handle, split second pause, than another fast turn. This causes the spoon to bounce up and down and to walk, sending out extra sound and vibration, plus a more exciting action. The manufacturing suggests twitching the rod tip to achieve this action, but I don’t want to get caught with a higher held rod and less of a hookset when a fish hits. While these two lures are the best for coming through anything. Charlie’s Weedless Bucktail (Wisher Lures 217-627-2028) has a weighted single hook that rides upright and it great for patchier cover. It can be flopped over pads or other surface cover, then run through an area of open water like a regular bucktail. Keep the rod tip up when retrieving over cover, then drop it down when the lure hits open water. Often patches of open water exist in the slop that are large enough to allow you to fish a lure with an exposed treble hook(s). I particularly like the Lindy Musky Roller bucktail for working the open water. It has a flared skirt that pulsates during the retrieve, and its round blade gives it lift so it can be run high at a slower speed if need be. Other excellent lures for working open-water slots are shallow-running crankbaits or twitchbaits. I wouldn’t use one of the 6-inchers sporting three smallish treble hooks. The lure is okay, but the hooks can’t be trusted to hold a big musky wallowing in heavier cover. Replace the small hooks with two bigger, stronger ones. I think the new 8-inch Jake will be great for the open slots. It’s durable and will toss a lot of flash to attract muskies holding under nearby cover. Work it with rips. Snag Proof has a new giant weedless frog in the works called the “Frogzilla.” If it has enough weight to cast with heavier line (you can put some shot inside the hollow body), this design should come through anything. Rods for slop fishing should have enough length to let you fire out long casts and make powerful hook-sets. They’ll also give you needed leverage when trying to control a big fish. I prefer a 6-foot -10 Tony Rizzo rod (R-757) and a wide spool reel with a superior drag and solid gears. The best I’ve used is Abu Garcia’s Morrum (M6600CL). Reels are spooled with heavy-test superlines in the 60- to 80-pound test range. This is not a job for stretchy mono. I favor 60-pound test Berkley Ultra-Max. I make my own wire leaders using at least 100-pound test single strand wire. On one end of the foot-long wire a size 4 Berkley Cross-Loc ball-bearing swivel is attached. A size 5 Berkley swivel goes on the other end. Both are connected with a hay-wire twist. When fishing slop-filled bays, I generally first move the boat along the deep edge of the vegetation, staying about 25 to 30 feet away from the edge. Use your electric motor or drift if the wind is right. Don’t get too close to the edge or you might run up on an outcropping of vegetation that’s the best spot in the bay. Although most of my action has come off the deeper one-third of the slop, sometimes you have to penetrate the mess even further. High water, fishing pressure, or bright sunlight may cause the muskies to hold even shallower, sometimes in just a few feet of water. A second pass may be needed to reach the shallower cover. Periodically check your big engine to make sure water is coming out of the exhaust port. Weeds can easily foul it and cause overheating. Muskies tend to roam around more on overcast days. Under those conditions the slots can be hot. Brighter conditions generally cause the fish to hole up under thicker cover and they have to be rooted out. Once you hook a fish in shallow, heavy cover just hold on and see what the musky does. You may get lucky and have it hit along the weed edge, or even follow the lure out to open water and blast it. That makes things easy. But often the strike will come in or near heavy cover. Just set the hook hard and hold the rod tip high. Often the fish will wallow, roll and twist, wrapping itself and weeds up in one big tangle. After it settles down, I’ll slowly move in toward the fish and net the whole mess with my magnum-size Beckman net. Everything will be sorted out in the water; the musky is lifted out for a quick photo, and then released. Slop fishing for muskies is exciting. Imagine hooking a 4-foot=long fish in shallow, weed-choked waters more suited for largemouth bass. Besides, it’s an underutilized fishery that can put extra fish in your boat every year. The first two bass fighting ventures of the year produced 31 bass, 29 of which I caught. The major reason? I was using the new thin, no-stretch braided lines. Both early-spring days were windy and the thinner line cut the wind to give me less line bow plus greater overall feel. On the first trip, the bass were smacking lipless, vibrating crank baits run just across the top of newly emerging weed-beds. I was able to feel the slightest weed contact and keep the lure from plowing down into the vegetation, something my partner using monofilament was unable to do. Two early season pike expeditions were highly dependent on technique. During one, pike were observed in shallow, early-to-warm bays slowly cruising or holding on bottom like unconcerned logs. The normal array of “killer pike lures” wouldn’t turn a head, as various anglers would cast awhile, then leave in disgust when the bigger fish wouldn’t bite. I knew this was “Slug-Go time” and rigged a 6- inch jerk work behind a short wire leader. Letting the lure slowly sink to the bottom, then working in painfully slow with slight twitches, turned the trick. Following pike could usually be teased into hitting by an even slower retrieve sprinkled with short hops that k i8cked up small puffs of silty bottom. Their big white lined mouths opened and inhaled the slow falling work, often with in a few feet of the boat. One of the most striking examples of technique came last June while pike fishing a shallow, dark-water bay just before dark. My partner and I had been catching some pike but no real tackle-busters. I had an impulsive thought that a top water lure might work but hasn’t brought any. Noticing a bass-size, double-propped, thin-profile plug in my companion’s open tackle box, I suggested he give it a try. After making a half-dozen casts using a pull-pause, pull-pause retrieve that activated the water-churning props to make a whirling sound, he made a few more casts using a fairly slow straight retrieve. The blade hummed softly, gently spraying water a few inches above the surface. No takers – the lure was put back. Even though small prop-baits were not on my “deadly big pike lure list,” I had a feeling. “Can I borrow that lure?” I asked. He politely handed it over. On my first cast a 20 pounder sucked in the 3/8 ounce lure. Six casts later a pike nearly 27 pounds engulfed the diminutive offering – both fish caught out of the same area we had been fishing! Pete sheepishly turned to me and softly asked if he could burrow his lure back. I would not have cast it anymore. His first effort carried long and the retrieve began. The whirling of the blades could be heard as the lure came toward the boat. Suddenly it dawned on me – I hadn’t heard the lure make any noise when I was retrieving it. “Put your rod tip down,” I suggested. My partner quickly lowered his rod tip, the humming sound ended and a pike well over 20 pounds sucked in the lure. The difference? A high-held rod tip caused a loud whirling noise that didn’t attract these early-season pike. A low tip kept the lure’s nose down and the blades quietly humped up the surface like a slow-swimming, easy meal. A few years ago, Field Editor Joe Bucher and I were fishing for early-season crappies. Our dime-size floats held small minnows right in front of crappies we could see in the shallow, cold water. We both used 4-pound test line and small hooks, yet Joe was catching four crappies to my one. The difference? I used a tiny split shot halfway between float and hook. Joe went weightless. I knew what he was doing and wouldn’t change. I just didn’t believe something that small could make a difference. But it did – Little things can mean a lot. Without question, jigs have produced more walleyes than any other lure. They have been bounced along bottom, hung below floats and have even been retrieved at mid ranges for suspended fish. But no matter how good of a jig angler someone is, there are always skills to be sharpened and new tactics to learn. A long-billed hat, polarized glasses, a gutsy rod with a sensitive tip and a whole lot of concentration are tools of the trade for the serious jig fisherman. But there area many styles, shapes and sized of jigs and a variety of ways to fish them. I’ve been jig fishing for many years and have learned or helped develop numerous techniques. Here are some favorites to cover tough fishing situations. Sooner or later the poor wing dam was bound to get a rest. Boat after boat had transported anglers who dragged live bait rigs, jigs and crankbaits across her up-current and down-current edges. This near dam hot-spot was receiving her usual amount of pressure and had yielded a few small male walleyes. After about a 45 minute lull we decided to move in. Quietly my partner and I slid in two heavy anchors off the bow and stern about 90 feet up current from the rocky structure. Enough rope was let out so our boat ended up a short cast away from the target, and parallel to it. From past experience I know that my go to lure for the current velocity and depth level we planned to fish would be d be a 1/8 ounce marabou-tailed Lindy Fuzz-E-Grub baited with a head-hooked minnow used with 10-pound test line. The plan was to cast our jig and minnow offerings to the up-current edge of the rocks. It is at this position on the wing dams that more aggressive walleyes and sauger usually hold, favoring cuts, washouts, deeper scattered rocks and anything else that may afford current-deflecting cover. In stained river waters Techni-Glo Fuzz-E-Grubs having some chartreuse on them are especially productive. After our lures touched bottom we began the quiver–which was basically raising a 6-to 7-foot soft tip rod from a 3 o’clock position to straight up, while constantly quivering or gently shaking the rod tip. The object is to lift the jig as vertically as possible while imparting a “nervous–scared” action to it. We were executing two important tactics for tough to catch fish–use smaller lures and keep them in the fishes face with a teasing up and down presentation. It wasn’t long before the first “strike” occurred. Actually the strike was the end of my partners soft rod tip bowing a few inches as he was slowly raising it during the quiver. A sweeping hook-set buried the small jig into the jaw of a fat, 7-pound, female walleye. Minutes later I landed one about 5 1/2 pounds. This was just one of many times this jigging tactic has worked for me. It’s most productive when used against a current flow. Water pushing against the heavier than normal line is what enables you to work the jig in a near vertical manner. A softer tipped rod is a must because you’re reading rod tip action for a take, which is simply a bowing of the rod tip. Use a jig just heavy enough to reach bottom. Generally 1/16 to 1/4 ounce weights are best. Lighter jigs are needed to achieve the proper lift and action. The marabou tail on a Fuzz-E-Grub gives the jig plenty of seductive action from just the river currents. The glide or swimming retrieve is used for walleyes in the weeds, particularly during the summer or early fall when they tend to be more aggressive. The benefits of this retrieve are that it allows for a relatively faster, horizontal jig presentation that can also cover various depth levels. Walleyes will tend to hold in specific areas in a large weed bed, and searching for the key spots with a slow, meticulous jigging retrieve often wastes time. Concentrate on points (including their corners), wider flats, sparser weeds surrounded by thicker growth, isolated, thicker clumps…basically anything different for its surroundings. The glide is best executed with a 6-foot spinning rod with good backbone and a fast tip. Spool up with quality, 6 to 10-pound test line you can see, with pound test based on weed thickness, jig weight and size of walleyes. I use 8-pound test clear monofilament line most of the time. A key ingredient in this tactic is the correct type of jig. It should be flatter in design with a pointed nose, and the eye tie should be right on the tip. The pointed head will part and slide through the weeds better than any other head design, and the wider body will allow the jig to swim upwards when moved, then glide back down when the retrieve is paused. After the lure settles to the depth level to be fished (I generally start at the bottom third of the water column), point the rod at the lure and while holding the rod tip about a foot or two above the surface, and begin to reel in the jig. I generally turn the reel handle 2 to 5 times, depending on how high I want the jig to come up, and then pause so the lead head swims back down. The jig is moved by cranking the spinning reel, not by lifting the rod. If fish are active, 4 or 5 fast turns then a pause while using a 1/4 ounce jig may be the key retrieve. If walleyes won’t chase much, 2 or 3 slower cranks between pauses, while using a 1/8 ounce jig could be the magic formula. Walleyes often suspend in the weeds. It isn’t uncommon to encounter fish halfway to the surface. And under ideal conditions (low light with aggressive cruising fish), I’ve found them just a few feet under the surface prowling the weed tops for forage. Under these conditions, let the jig sink for 3 to 5 seconds after splashdown and begin a fairly quick crank and pause retrieve. Always watch your line for movement as the jig flutters down between cranks. That’s when almost all hits will occur. If the weeds are thick nothing works better than Lindy’s No Snagg jigs. There are two styles of jigs I particularly like for “the glide”. If weeds are clingy and an open-hooked jig is hanging too much, a Veg-E-Jig or Timb’r Rock jig is used. Both these jigs have adjustable 7-strand wire guards. Jigs can have a plastic dressing if fish are active, but most of the time they are dressed with a minnow in colder water and a leech during warmer weather. At the time I viewed myself as being quite and accomplished jig fisherman. So I was a little shocked and quite humbled when the angler next to me kept catching fish after fish on jigs while I drew blanks. We were both wading a large eddy on the Mississippi River and he was constantly pulling in walleyes, sauger and white bass. I had been successful, but about an hour previously they shut off, at least for me. We were both using jigs and casting up current at about a 45° angle. I decided to stop line watching and begin angler watching, carefully scanning his every move with my peripheral vision. Hmm…he was using two small jigs in tandem instead of one larger lead head. Then I noticed he wasn’t even turning the reel handle with any consistency during most of the retrieve, but rather keeping the line fairly tight as the small lures gently washed along bottom. He lightly snapped his rod upward every now and then, and about half the time the rod bucked from the head shakes of a fish. After moving closer, watching intently and swallowing my pride enough to ask a few questions, the tactic was figured out. My eddy-sharing colleague was using two lightweight jigs that were rigged in tandem. After the cast was made, the jigs were allowed to tumble down current along bottom. When the drift halted, due to a minor hang on the clean, sand bottom or by a fish sucking it in, a flick of the rod either loosened the jig or buried its sharp, small hook in a fish. Since that day I’ve successfully fished a tandem jig set-up in current over cleaner bottoms many times. I’m still not sure why it will usually catch far more fish than a single larger jig when fish are not aggressive. The smaller sizes are probably a factor, plus two lures just may be better than one because you can experiment with color and jig type. Also the jig on the short line (a Fuzz-E-Grub) usually catches most fish because it has more of an up and down action, while the other comes in more horizontally. It’s very important to use enough weight so the jigs hit bottom, but not so much weight that the current can’t drift them across bottom. For some reason two 1/8-ounce jigs will drift better than a single 1/4-ounce jig. This rig works anytime of the year. Its bet fished on a 6 to 7-foot spinning outfit that is rated for lines 6 to 10-pound test. I generally use 6-pound test monofilament or 10-pound test braid with a fluorocarbon leader. I wouldn’t have believed this jigging tactic would out fish live bait for big, tough-to-catch walleyes in deeper water, but I saw it happen …many times! “The Shake” is similar to the River Quiver except that with this retrieve the jig is coming toward you, not dancing up and down in the current. This tactic is designed to tease walleyes in deeper water into hitting that refuse the other presentations. It is a last ditch effort to try, because it’s a slow meticulous retrieve that will not allow an angler to cover much water. It is best used in proven pin-pointed areas, on structure-hugging fish seen on a sonar, or after a fish or two had been caught off a spot and you suspect there are others around. The hard-bottomed tip off a big weed flat, isolated fingers and turns off a large bar and a small hump are classic spots to try this retrieve. It’s important not to waste casts to unproductive parts of a structure, so I generally use a floating structure marker in conjunction with this technique. The marker is not tossed right on the area to be fished, but rather slightly shallower off to the side. When fishing the 10-15 foot range I try to use a 1/8-ounce jig with 4-pound test mono. For probing bottoms over 15 feet, a 1/4-ounce jig on 6-pound test is standard. Wind, water clarity and cover may require slight adjustments in the presentation. A soft-bodied jig that has a marabou tail (Fuzz-E-Grub), or one having tiny, sensitive, slivers of plastic off its end (tube style) are recommended. It’s important to dress the jig with live bait–either with a smaller leech or half of large nightcrawler (or whole, smaller one). If the water is stained Techni-Glo Fuzz-E Grubs are deadly. Colors with chartreuse in them seem to be the most productive. The shaking style retrieve keeps quivering and nodding the jig along bottom to tease the walleye into sucking it in. To make it even more tempting and visible, the leech is hooked behind the suction cup so it swims upward, and the crawler is injected with a bubble of air near its tail with a Lindy Worm Blower. Sometimes a stand-up style head works better than a round head. This is usually when fish are taking the jig during pauses in the retrieve. An ideal cast splashes down about 15-20 feet past the key spot to be fished. As the lure is sinking make sure the line is constantly peeling off the reel, even if some of it has to be pulled out by hand. If your reel is engaged when the lure hits the water the jig won’t sink straight down, but will come back toward you in an arch, often causing you to miss at least part of the targeted area. Once the lure rests on bottom, as indicated by the line going a little slack, point the rod tip at the lure and a foot or so above the surface. Gently start shaking the rod while slowly lifting it to a 12 o’clock position. Pause 3-4 seconds, drop the rod tip back to the original position while picking up the slack, and repeat the sequence. A take will show as a dipping of the rod tip as it’s being worked upward. A longer rod (6 1/2 to 7 feet) with a sensitive tip is recommended. This tactic takes big walleyes! I’ve even seen it work great after a spot had been fished with live bait behind slip-sinker rigs. mid-winter is a tough time in the north. Our favorite lakes are covered with ice and hunting season is pretty much over. Out of desperation I began fishing for panfish, soon discovering a mid-winter treat that had long been ignored. While ice fishing definitely fills a void and is as challenging as open water angling, it also supplies as with some of the sweetest fillets a person would ask for. If your taste buds are up for a challenge, fry fillets in Cajun-style breading, then dip each fork full into a pile of blue cheese dressing and then “buffalo wing” sauce before popping them into your mouth. You’ll be planning your next trip very soon. Some of the best ice fishing usually occurs during “first ice.” As the name implies, this is when the ice becomes safe enough to walk on. I know a few avid ice anglers who are slight in build (and gray matter in their heads) who venture out over wafer thin ice, and generally fall through at least once a year. But they are savvy enough to fish in pairs, plus carry ropes and giant nails to help pull themselves out of the water. I wait until the ice gets 3-4 inches thick, and even then tend to fish over the shallower flats during the beginning of the season. First ice may occur numerous times, especially if you live in the southern third of the ice fishing range where warm fronts cause frequent thaws. Each time the ice gets thick enough to fish, panfish move into shallower, first-to-freeze areas. Sloughs canals, ditches—any type of backwater areas off a lake or river—can harbor droves of these tasty panfish. Slow-tapering shorelines on lakes can be very productive, especially if cover exists on the flats. As winter progresses and the ice gets thicker, a panfish exodus to deeper water occurs. Pockets or holes in deeper weeded areas, deep weedlines, drop-offs, plus off-shore humps, bars, and points can all be productive, plus schools of suspended panfish can often be found with electronics. In shallower bodies of water, mid-winter panfish, especially bluegills and perch, can often be located smack dab on the bottom in the deepest sections of the lake. During late winter, a time when the weather begins to warm and the ice begins to weaken, my ice fishing efforts drop dramatically. Fishing can be exceptional, but weak “black ice” makes me generally opt for the open waters in rivers. When I do get out, hot action is generally encountered on the flats just outside panfish spawning areas. Excellent results are often experienced in the 3-8 foot depths, especially very early or late in the day. Once a specific area is targeted to fish, I usually drill between 8-15 holes. A power auger is the ultimate drilling tool, but a good, sharp hand auger will do the job, especially if the ice isn’t super thick. Two excellent hand augers are “The Edge” by H.T. Enterprises, and Strike Master’s “Laser” model. Both these augers will cut through the ice in a few seconds. After the holes are cut and the chipped ice is removed with a skimmer, I’ll start fishing, first working the earlier drilled holes. The object is to eliminate unproductive holes and find the ones that produce even a fish or two. When starting to fish in early morning when the “hot bite” should occur quickly, holes will generally be drilled in pairs. This is because I don’t want to be drilling next to a hole that’s producing fish during prime fishing time. If starting to fish in mid-day in anticipation of a late afternoon to dark bite, holes will be more singularly scattered about. Once I make the rounds and fish all the holes once or twice, the productive ones will be noted. It would be common to catch a least a fish or two out of 2 to 5 holes. The plan would then be to quickly drill another hole next to each productive hole so two rods can be fished. This would be done well before the prime late afternoon to dusk hours, allowing the immediate area time to settle down after the drilling. I wouldn’t give up on all the holes that didn’t initially produce, and would periodically try them again. A couple things to consider. If a few of the unproductive holes were right into thick areas of weeds, I’d put a long stick or hand auger as far down into the hole as possible and make several big circles with it. This will create a hole in the weeds, and stir up the area, often attracting fish within minutes. Also if holes in 8-10 feet if water were productive during the mid-day hours and holes over shallower were not, re-fish the shallower area if the action comes to a halt in the 8-10 foot range, Sometimes the fish simply move in shallower. During the last 45 minutes before total darkness, stay on the holes that were producing best earlier in the day. Numerous times I’ve seen anglers dejectedly walk off the ice just before dark with few fish to show for their efforts, and within minutes of them leaving the fish went on a rampage. The sad part is that they may have worked hard all day, only to miss that last half-hour of non-stop action. I’m generally fishing for bluegills and crappies with short spinning rods that have very soft tips. The soft tips enable me to use lines in the 1-4 pound test range, set a hook without popping the line, and battle a big panfish that may weigh more than the line test. I tend to use the shorter rods (24 inches) when in a shelter, while the longer rods (27-30 inches) would be preferred on open ice where holes are drilled a little further apart, and when using fixed floats. I usually have at least 4-5 rigged rods with me. Extra rods are pre-rigged in the warm comfort of my home, because cold fingers, gossamer thin lines and tiny eyelets, coupled with eyesight that’s not quite as good as it use to be, can cause some serious re-rigging problems on the ice. This is particularly true if the fish are biting and you’re nervously trying to rig up fast. During a time when the action is hot and heavy, the last thing you want to do is attempt to tie knots with cold fingers. And if the fish are hitting during the last few minutes of light, tangles are inevitable. Just put the messed up rod aside and grab a fresh one. If probing fishing waters less than 10-feet deep, I constantly check depth levels from a couple feet under the surface to the bottom. Under lower light conditions, during warm trends, or when the panfish are real active, it’s not uncommon to catch fish (especially crappies) just a foot or two under the ice. If legal to use three lines in the water, I often jig fish with two and put a tip-up out for high-riding crappies. A small back-hooked minnow behind a split-shot is set 18-24 inches under the ice. In depths of 10 feet or less, this rig often produces bonus fish and alerts you of a depth pattern that may have been missed. While most pan fishermen use ultra-sensitive spring bobbers on their rod tips to detect light bites, I tend to be a line watcher. A visible line is on the reel, which is linked to a fluorocarbon leader about 18-24 inches long. The line is almost never perfectly straight when fishing with a lightweight lure, so I can watch for a slight kink or bend in the line to straighten out as a fish takes my tiny spoon or jig on the lift. A bite on a free-falling bait, or when the rod tip is lowered, can easily be noted when the line buckles. In deeper water where heavier weights may be needed, a spring bobber may be preferred by some anglers. When testing for depth, your jig can show you bottom in shallower water. In deeper water, an ice fishing “depth finder”, which is basically a weight on an alligator clip, will give you a fast and accurate reading. Sometimes I’ll lay a rod across the opening in a 5-gallon pail, and let the line hang in the water so the wind moves the line and bait around. A float adjusted so it’s about a foot above the ice catches the wind and allows the lure to move more. It’s also easier to spot a bite on a float-rigged rod, as the motion on the swinging float will be halted when a fish pulls the line taught. Another advantage of super-sensitive, European- influenced floats such as those made by Thill Tackle, is even the lightest bites show up. A fish doesn’t have to pull a dime-size float under, just the tip of a balanced float, which is about the diameter of the tip of a pencil and about 1/8 of an inch long. “Balanced” floats—that’s the key to float-fishing success. Until you get to the point where you know what size ice lure balances with a specific float (weighs down the float enough so that just the tip barely breaks the surface), practice mixing and matching at home. Just take a glass of water, a float such as a Thill Mini-Shy Bite (my favorite), and hook an ice spoon or jig on one of the rubber sleeves. Drop it into the glass and see what happens. If it sinks, go to the next size float. Four sizes are available with the numbers 2 and 3 being best for typical spoons and jigs. 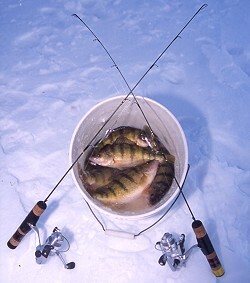 Floats can be changed on the ice, as the Mini-Shy Bites are all interchangeable by slipping them in or out of the two rubber sleeves that come with each float. When fishing deeper water a fixed float becomes hard to use. Good modern float options are the pear-shaped Thill Mini-Stealth, available in 6 sizes, including one that glows in the dark, and the smaller size Center Sliders. All these floats will do a far better job than the bulky round or sponge-type floats we used for years. Every ice angler has their favorite baits and I’ve used them all. Sometimes several small” spikes” do a better job than the larger wax worms, which are generally fished singularly. Often the opposite is true. A spare rod may hold a lively “wiggler” a few inches off bottom (use with thin-wire size 8-10 hook). The biggest “bait breakthrough” I’ve seen in recent years is you often don’t need any. Tiny spoons and jigs tipped with slivers of plastic may often do as well, or even better than lures dressed with natural bait. Some of the best ice anglers I know carve small pieces of plastics in different shapes and sizes to put on their ice-fishing spoons and jigs, and they commonly out fish nearby bait anglers. There are hundreds of ice-fishing lures on the market, but the ones I really like some of the glow lures made by Lindy Tackle. The Fat Boy is high and narrow so it sinks well for its weight yet provides a great horizontal profile. The Flyer ice spoons are just the opposite. They are wider, sink much slower and when jigged they imitate the life-like side to side darting of injured or frightened forage. The 1/16 ounce Frostee jigging spoon is great on crappies and big perch, and in the larger sizes it’s a real killer on walleyes. Tipping any of these spoons with live bait such as grubs, minnow head or small minnow often increases productivity if the bite is slow. When initially working a hole, an aggressive jigging action is usually executed first. I believe a more active jigging presentation attracts nearby fish that move in for a look. A more subtle presentation catches the most fish, although winter panfish can get pretty active. I’ve seen where the larger fish wanted only larger spoons worked vigorously. The opposite has been true when large crappies and ‘gills will only take a near-microscopic offering that’s barely moved. Once you do hook a decent size fish don’t try to pop it out of the hole too quickly. Line can easily break, especially if it rubs on the ice while a bull bluegill circles under the hole. Soft-mouthed crappies can also easily tear loose from a tiny hook. If the fish has some meat on it and you are using 1-2 pound test, play it a little, get it to the hole and scoop it out with an ice skimmer or your hand. Heavier line allows you to slide them out, and I clear the snow from a side of the hole for this purpose. Ice fishing can be a lot of fun and it’s pretty easy to get started. And when you dig into a platter of crisp-fried panfish, you’ll join the fraternity of those who stalk the frozen waters. For more information about any of the fine Lindy Tackle products mentioned in this article please visit their website at: http://lindyfishingtackle.com.